Charlie Phillips here, I’m the adopt a dolphin field officer for WDC and I think that I have one of the best jobs in the world in the North East coast of Scotland near Inverness. It’s a really lovely place and so is my ‘office’, a peninsula called Chanonry Point where for over twenty years I have been watching, studying, photographing and filming the wonderful population of resident bottlenose dolphins. I especially love telling our adopters about encounters I have had with the dolphin they have adopted through the monthly e-newsletter video updates and also in Splash, their quarterly magazine. 2018 has been a rather strange year in some ways yet fairly typical in others – predictably unpredictable! 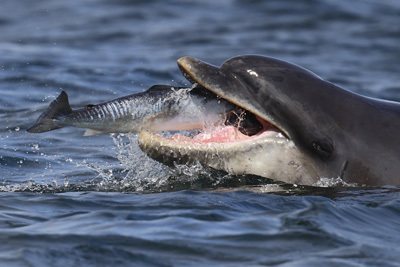 When winter slowly gives way to spring up here in the Inner Moray Firth, the migratory salmon start to head back to the rivers where they were born and it’s not long before the area’s top predator, the bottlenose dolphin, starts to make daily appearances. The unique habitat of Chanonry Point is a great place to watch the local dolphins because the tidal flow brings the salmon close to shore and the dolphins charging in after them, including the six adopt a dolphin stars: Kesslet, Rainbow, Moonlight, Spirit, Mischief and Sundance. Sadly, the salmon run has been very poor again this year, with seemingly fewer and fewer fish coming back from the sea. This has a direct impact on the behaviour of the dolphins– how often I see them, for example, and also for how long. This season I’m seeing the same individuals but for a shorter period as they don’t stop off at Chanonry for as long to forage. I’ve had some lovely days where I have had four adoption dolphins within camera range near Chanonry Point and I’ve managed to get some nice pictures only a few metres away with my big camera lenses. Rainbow gave birth to her fifth baby in the late summer, a little brother or sister to Indigo and Prism who are still living in these waters. It’s great to see these wee beauties growing up so quickly as they stick closely to Mum’s side. On 1 September, Kesslet had her fourth baby and we know that this little dolphin is a girl as I saw her up close when she was only a few hours old. If you adopt Rainbow or Kesslet, I’ll bring you plenty of updates on how these wee babies are doing. Moonlight and Spirit have spent more time away out at sea than at Chanonry this season, but I have had super sightings of them in the open water near the Cromarty Firth. Moonlight and young Shadow were chasing salmon and mackerel with Moonlights older son Lunar. I had a wonderful encounter with Spirit who had her year-old baby with her and her young daughter Sprite too – in the distance was Sparkle, Spirits older daughter with her own youngster and Shimmer was in the area too – the whole family! Mischief has been great this season. Anywhere I have been with a camera he seems to be there, larking around with some of the other big males or having quiet time with some of the females and their youngsters - I have really enjoyed pointing him out to adopters who have been here on holiday. Mischief’s big buddy Sundance hasn’t appeared so far this year, but he sometimes comes in after shoals of herring over the winter so I’ll be keeping a careful watch out for this fantastic big character. The tricky, cold, windy and wet days are more than outweighed by the great times watching groups of dolphins doing what they do best – being beautiful, wild and free. Seeing the adoption individuals always gets my heart beating a good bit faster, especially if I’m with WDC supporters either on the beach or on a boat. It’s such a pleasure to share their joy when they see their adoption dolphin…it’s what gets me up in the morning. If you don’t already, I would urge you to adopt a dolphin with us today, either for yourself or for a loved one at Christmas. 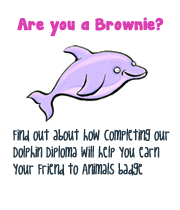 You’ll get a great welcome pack and then every month I’ll update you by email, bringing you video, photos and news on what your adopted dolphin has been up to. Plus you’ll receive your supporter magazine every three months. And who knows, you might have the chance to visit this beautiful part of Scotland one day and watch the dolphins in the wild, where they belong.